07/2010: University Heights Science Park (UHSP) has sought several times to obtain the approval to level most of the surviving structure from the City’s Landmarks and Historic Preservation Commission or from the NJ HPO and has failed. On September 29, the City of Newark’s Landmarks and Historic Preservation Commission unanimously denied an application by University Heights Science Park to demolish the remaining structures on the site, based largely on the fact that although the Science Park is overseeing a redevelopment plan for the area, they have failed to release any specific plans for use/redevelopment of the Essex County Jail Site. As this time, the property remains vacant and continues to deteriorate. UHSP is a collaborative venture between Newark’s higher education institutions, the City and Community of Newark, and private industry. It is designed as a 50-acre mixed-use, science and technology park in the city’s Central Ward, adjacent to the Park’s four higher education sponsors: NJIT, Rutgers University at Newark, UMDNJ, and Essex County College. 3/2011: The City of Newark has secured a $50,000 New Jersey Historic Trust grant for the Essex County Jail. The grant will help fund the preparation of a study to determine existing conditions and potential for reuse of the buildings. The project will develop a definitive reuse plan that is satisfactory to the various stakeholders in the property. The Essex County Jail is the oldest public building in Essex County, and one of the oldest structures in the city of Newark. Its first sections were designed in 1837 by John Haviland, in his day, one of the most important architects of public buildings, particularly prisons and penitentiaries. The Haviland portion consists of the warden’s house, the east wing, and a twelve-foot-high wall, all made of stone. They are good examples of the classical proportions and simple geometric forms of Greek Revival architecture. In addition to the 1830s buildings, eight additions were made to the jail between 1890 and 1909, including the “women’s wing,” the warden’s office, a power plant, a hospital, a laundry, and cell blocks. These later brick buildings complement the original buildings. The ten-building jail complex, which occupies 1.52 acres and an entire city block, continued in operation until 1970. It has been completely unused since 1989. In 2000, the City of Newark purchased the building. Unfortunately, a portion was demolished after a fire in the summer of 2001. 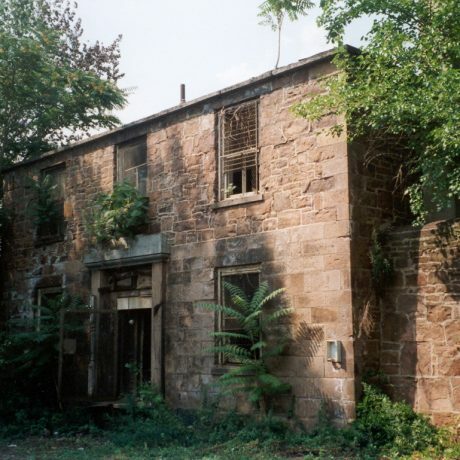 While there has been much damage and deterioration, the exterior of the warden’s house — which is the main focus of the prison exterior, the exterior of the east wing, and large portions of the original wall remain intact. Abandoned jails and prisons elsewhere in the county have been preserved and put to new uses. We urge the city and the University Heights Science Park (a consortium of the major institutions of higher learning in Newark) to explore ways to reuse this nationally significant architectural treasure. The building continues to deteriorate and part of the roof of the old warden’s house has collapsed. Fencing around the complex has been largely ineffective in preventing intrusions.